Topaz PVC products are strong and long lasting; fabricated for optimal safety during installations. Our Schedule 40 PVC Single Receptacle Cover features spring loaded lid with a weather seal gasket to prevent damage from moisture and other elements. 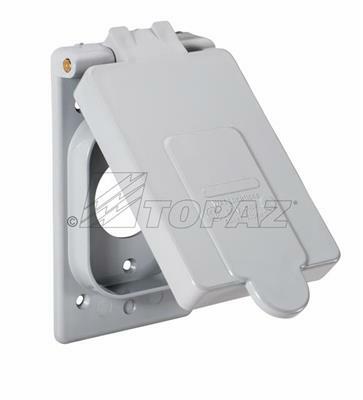 Receptacle is weatherproof when closed; fits a single receptacle. Fabricated from rust proof, nonconductive PVC to accommodate 15 through 50 amps; cULus approved.